Lets take a look at how this mini powerhouse performs in other areas as well, including talk time and web browsing. 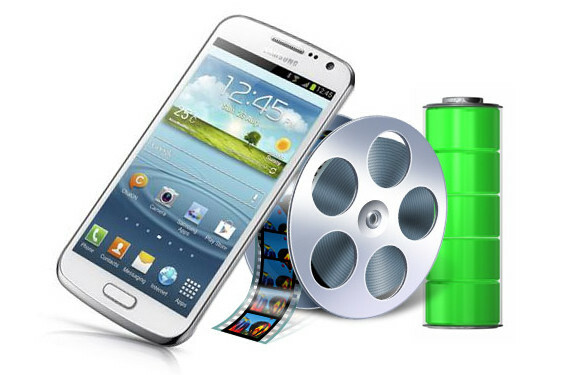 The Premier features the same 2100 mAh battery found on its older brother, the Samsung Galaxy S III, yet it only has to power half the amount of CPU cores . Understandably, we expected good battery performance, and we weren’t disappointed. We saw some good talk time figures, with the Galaxy Premier even slightly exceeding its manufacturer-rated talk time. The Premier comes with Android 4.1 Jelly Bean preinstalled, which means great web browsing performance out of box. 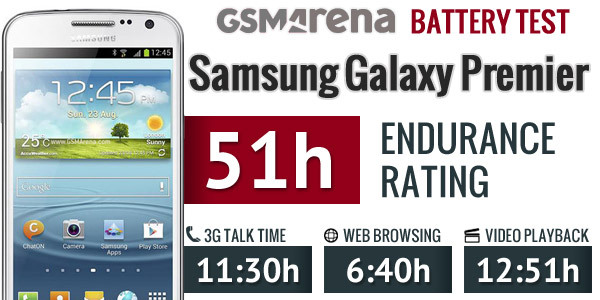 The Premier came in at 6 hours and 40 minutes of browser performance, which is better than what we got for the S III. As we said, video playback is where the Premier really shines. It was able to keep going for just under 13 hours with it, which is better than even some tablets out there. We’re not sure, but perhaps the PowerVR SGX544 GPU on the Premier is more efficient at decompressing video than the Mali-400MP on the Galaxy S III, which it outperformed by almost 3 hours. Finally, standby performance is right on par with what you’d expect from a device with these specifications – it doesn’t seem to be doing too many battery-draining activities while it’s in standby. All of our tests give it a very respectable 51h endurance rating. Ultimately, the Samsung Galaxy Premier showed some really good battery life, on par with what we’ve come to expect from this most recent lineup of Samsung Android smartphones. If you watch a lot of videos on your phone, it’s easily among the best out there.